Raw mango is known as ambuli in konkani, mavinkayi in kannada or kairi in marathi. Though the season of mangoes is coming to an end, raw mangoes are still available on the shelves of supermarkets over here. 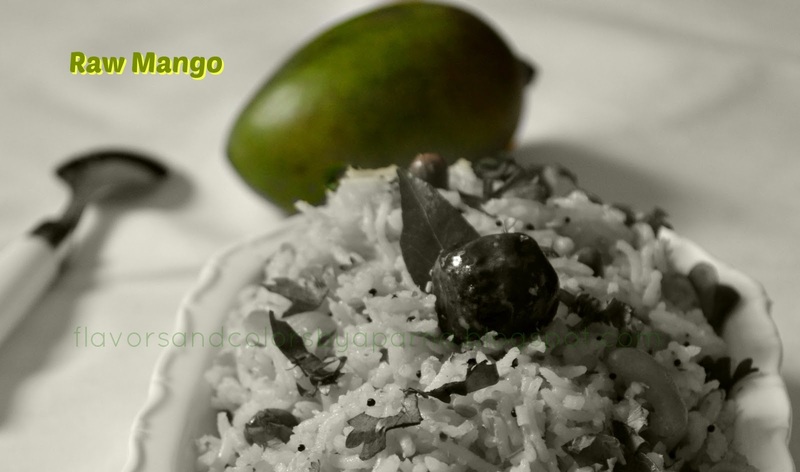 Today's recipe is a delicious variety rice using these raw mangoes. 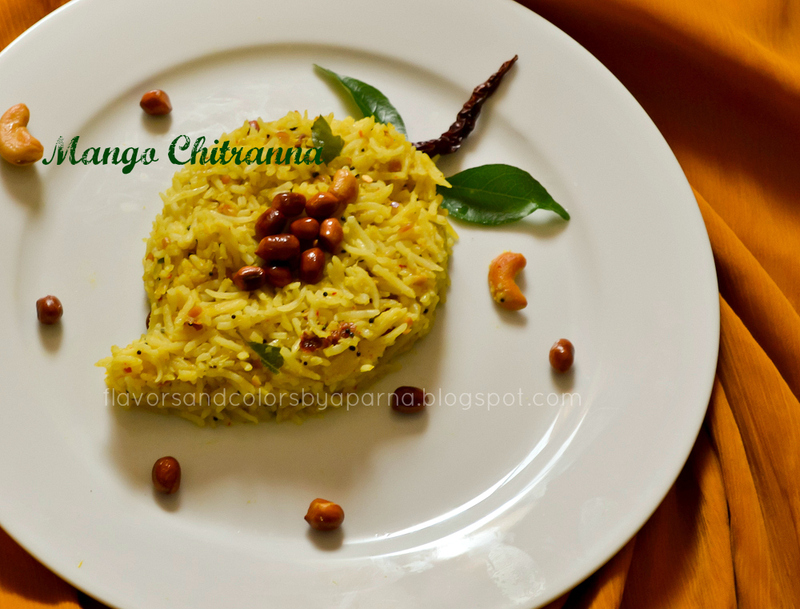 Popularly known as Mavinkayi anna/ chitranna throughout South India, the recipe here is an adaptation of the recipe by Asha aunty. Clean, wash and cook rice in enough water with salt. Take care that the grains remain separate. Spread on a large plate to cool. Dry roast methi seeds. Grind coconut, red chilies, methi seeds, mustard seeds and grated mango to a fine paste. In a deep pan, heat some oil. Add mustard seeds, when they crackle add urad dal and curry leaves. Add turmeric powder, peanuts and cashews. Stir fry for a minute or two. Add the ground paste and saute it on medium flame for few minutes. Add cooked rice, salt, sugar and mix well. Cook it for 5 minutes over low flame. 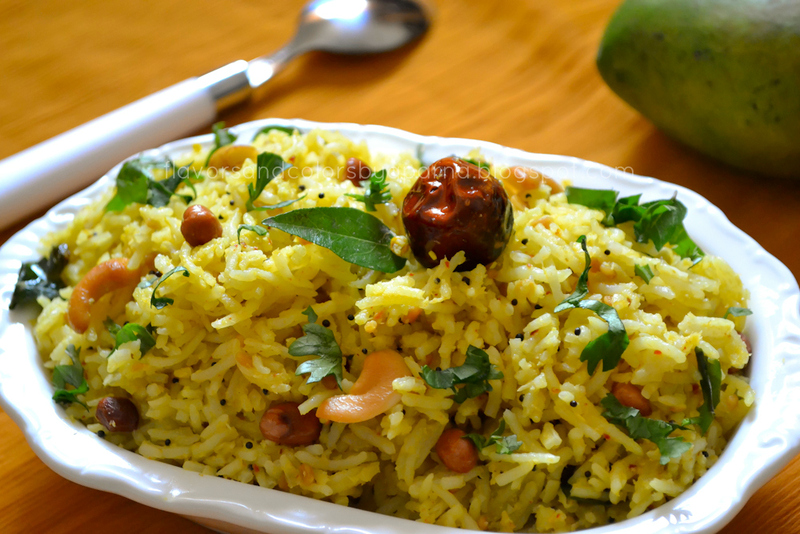 Garnish with some more grated mango and finely chopped coriander leaves. Mix well and serve it hot with papad.